We continue to improve our ability to read, write, and edit DNA on larger and larger scales. GP-write wants to gather and coordinate the global enthusiasm around large-scale genome engineering to bring about some major advancements in several areas. Overall, they have the goal to reduce of cost of building and testing large genomes by over 1,000-fold within ten years. This major reduction in cost would require large improvements in methods and technology, but large-scale projects like the synthesis of a human genome may be what's needed to push the field to that point. Researchers and stakeholders met in a Boston auditorium to discuss all sorts of issues around synthesis of a human genome and large-scale genome synthesis in general. This year's meeting follows the 2016 confusion and accusations of a "secret meeting" when the GP-write project was first getting started and a 2017 meeting with almost 250 participants. I went this year as a volunteer and got to hear from the nine working groups of GP-write and the challenges that they're working through. The goals from the different working groups and the overall community include dimensions of technology development, community engagement, scientific opportunities, and public policy. All of those dimensions come into play as GP-write lays out an ambitious project called "UltraSafe Cell Line." In the first session of the day we got talks and a panel discussion among some premiere synthetic biology leaders: George Church, Jef Boeke, Pam Silver, and Farren Isaacs. They introduced and discussed the big goals of the GP-write scientific roadmap including the "ultra safe cell line" project that would make human cells that viruses cannot infect. The idea of synthesizing human genomes had already been put out there, but there still has to be a specific design goal with the human genome that could be shared across many labs around the world to work on different parts. If you're going to be makes changes across a full human genome it might as well have some serious benefits over the cell lines we already have, and human cells that are completely resistant to all viruses would be a huge boon for basic research and therapeutic development. Several attendees noted their favorite genomes that they would love to have created, but the hope that the virus resistant cell line is just the start. Cells can be made virus-resistant by "recoding" them to remove all instances of a redundant codon. Since three letters of DNA correspond to what amino acid to make and there are four different DNA letters, there are 64 possible three letter combinations or "codons." Since there are only 20 amino acids, researchers can remove all of a certain codon and replace it with another codon that codes for the same amino acid. That way the protein sequence remains the same but there is a codon for which you can remove its associated machinery without affecting the health of a cell. 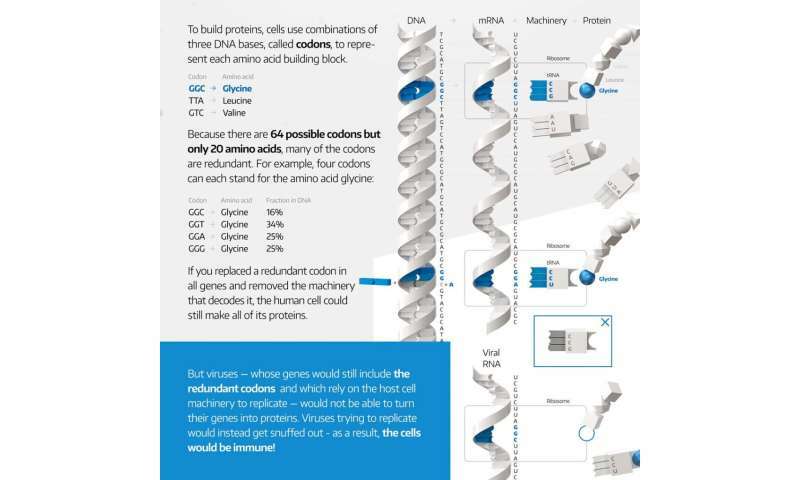 These changes mean that one codon can longer be used for its original amino acid so any new sequence, like a virus trying to infect a cell, can't express its genes if it has of that codon in its coding sequence. So any virus that enters the cell gets stuck in its replication process when it tries to get the cell's machinery to read out the codon that no longer code for an amino acid. A cell line that can't get infected by a virus would reduce research complications and contamination risks when cells are used for biomanufacturing of a therapeutic. 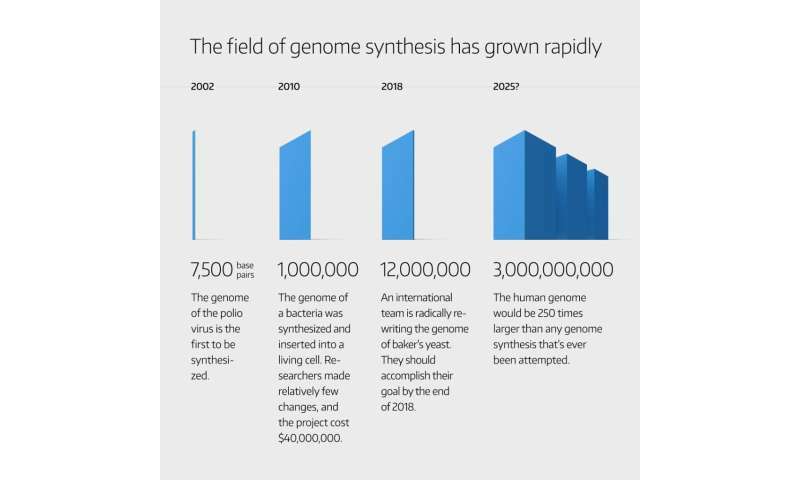 A small bacterial genome was first synthesized in 2008 (less than 1 million base pairs) and put into a synthetic cell in 2010. Now teams across the world are working to synthesize and test the 16 baker's yeast chromosomes (12 million base pairs) with reports of the first five coming out in 2017. There was some new updates on the synthetic yeast project called Sc2.0 but it's not expected to be done until later this year. The human genome is way bigger than bacterial or yeast genomes so it's going to take new techniques to efficiently assemble and test construction all along the way. Even though the "ultra safe cells" project only requires changes in ~1% of the genome involved in directly coding for proteins, there are still changes across the full genome. Then there's the matter of how to get it into a human cell or ensure that the 3-D structure lets genes be expressed in a way that makes a healthy cell. Teams participating in GP-write will be expected to deliver particular parts of the overall sequence design to exact specification, but there's room for people to try out and innovate on different methods. The speakers emphasized over and over the need for new technology all along the process from design, synthesis, testing, and analysis. Some of the specific technological needs mentioned included software for collaborative design, models for genotype-to-phenotype, improvements to synthesis assembly, cheaper DNA synthesis, synthesis of tricky sequences like repeats or GC rich sequences, and increased automation along the process. The challenge will be integrating many of best innovations as large teams work on collaborative projects that would be difficult to finish in just one lab. Most labs and workflows are set up to complete contained pieces of research and share data and resulting tools later, but global collaborations mean that labs need to do compatible work. If teams innovate in different areas as they complete their part of the genome project then the next project iteration will have to decide what to incorporate from the beginning design phase. To truly achieve large reductions in genome synthesis and testing, lots of new technology and improvements will need to be used all together. People love a concrete motivating idea and scientists are often looking back at the race to the moon landing as an example. "Moonshot" initiative are supposed to bring the community together around a larger goal to work toward and use to spark broader discussions. Part of the messaging beyond scientific accuracy has to be motivating the field as one speaker said, "get people as excited about GP-write as they were about going to the moon." I'm not sure if the excitement will be that widespread for something that's not tied in with a Cold War but specific goals within the scientific community can certainly be motivating. "Get people as excited about GP-write as they were about going to the moon"
The communications and public outreach working group talked about their efforts at media outreach and new graphics (two good examples are embedded in this post). Certainly they want to at least make sure scientifically accurate stories get out there and avoid controversies like there were around the supposedly secret meeting in which this project launched. That rocky start in media coverage and accusations of not properly considering the surrounding bioethics has to be on the minds of the GP-write team. There has to be a conversation with the public that considers various concerns and communicates in a transparent and understandable way. After the first overview session, the next session was on "social, legal and ethical issues." They stressed engagement and conversation that doesn't assume that other stakeholders understand all of the technical details. A common community concern that can come up in discussions is safety around synthetic biology or genome synthesis projects. Although it seems that most of the projects being discussed at GP-write are not themselves a major safety concern (I didn't hear any desires to synthesize pathogens), there could still be concerns around genome synthesis technology. When journalist Antonio Regalado asked "What should I be scared of when it comes to synthetic chromosome?" it was met mostly with talk of future misuse of the underlying technology or release of synthetic organisms that would have unknown impacts on the environment. At the moment, GP-write is not a major source of funding like some big scientific projects out there since teams will be expected to find their own funding as they participate in the overall project. It may still find more funding but I think there can be plenty of value is in organizing researchers and stakeholders. In the end if GP-write is a success it will be because it organized and motivated globally-dispered researchers around some big concrete goals.